At this time the High Road was still a main through route, and busy shopping centre, but was already declining, as the various for sale signs indicate. The gas holder, which still exists, can be seen in the background. I have found this site really great as I was born in New Southgate 57 Upper Park Road. in 1946 I went to Garfield (road) School and these pics. have brought back many memories. I have some photo's of my own and might like to share them but I'm have trouble connecting to up load a picture. Hi Clifford - why not contact me on 01782 551849 about your photos you want to share? I lived opposite you in Upper Park Rd 1948-1964. Email peter.len.turner. You might get in the last memories book in 2019, if you are quick. 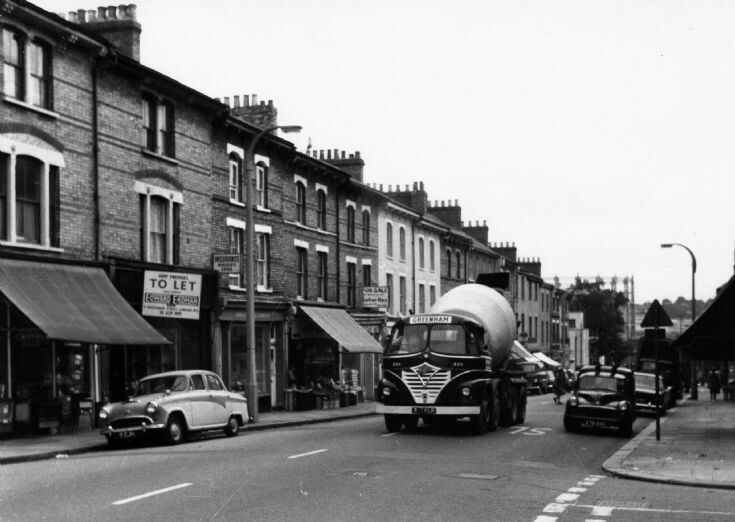 I grew up in the Devonshire Café, 116 High Road. The proprietor was my grandmother Mrs T. E. Spurrier. She had seven children. All bar one survived infancy. Six married so there were six children-in-law. There were 18 of us grand-children and in the early fifties we all lived within 200 yards of the café.